Cut and stitched from the last remaining pieces of the scrap bag, Postage Stamp quilts and String quilts represent the ability of our quilting predecessors to be able to make wonderful quilts out of myriad fabric fragments. These scraps gathered from the remains of worn out clothing, practical sewing done for the household and treasured pieces from the dressmaker’s basket became the quilters’ palette in creating beauty and warmth for their loved ones. 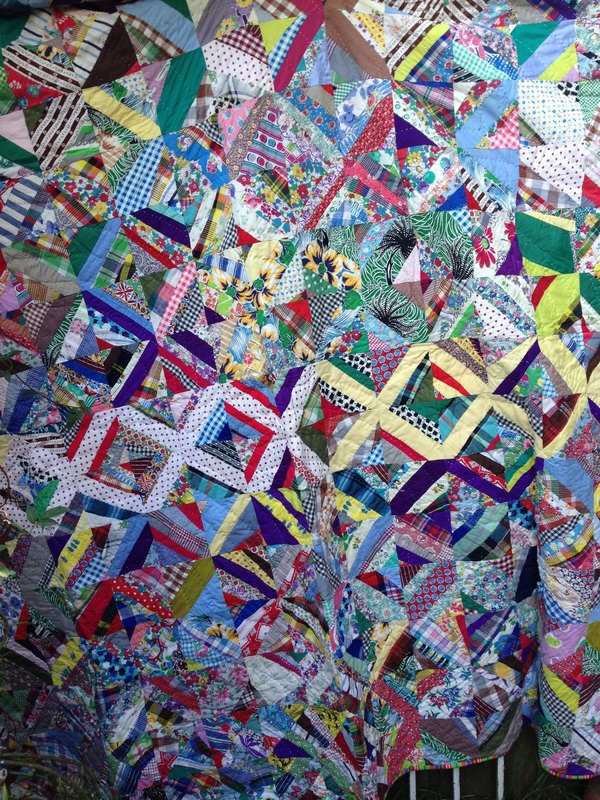 Throughout the years of hardship brought about by the Great Depression of the thirties quilters kept busy with needle and thread, stitching quilts to brighten their lives and lighten their spirits. Fortunately many of these quilts have been preserved and we can enjoy studying the style and artistry of the makers who created beauty out of the scrap bag. Set against a white background and solid red squares surrounding the assorted patterned fabrics, these quilts consist of 5,670 seventh/eighths inch squares. Each quilt measures 58 inches by 82 inches. The fabrics are typical of the 1930s with a couple from earlier decades. An earlier fabric included here. A darker red amongst the pastels. Some of the fabrics show signs of wear which indicate they were probably cut from used clothing. 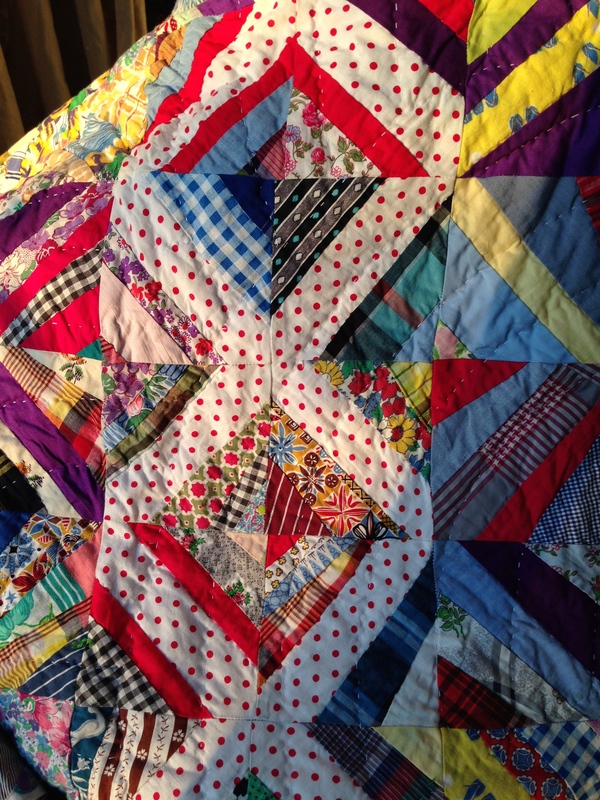 The quilt was skilfully machine pieced (more than likely on a treadle machine) using tiny seams. There were no rotary cutters or quarter inch seams in those days as that would have been considered far too wasteful. 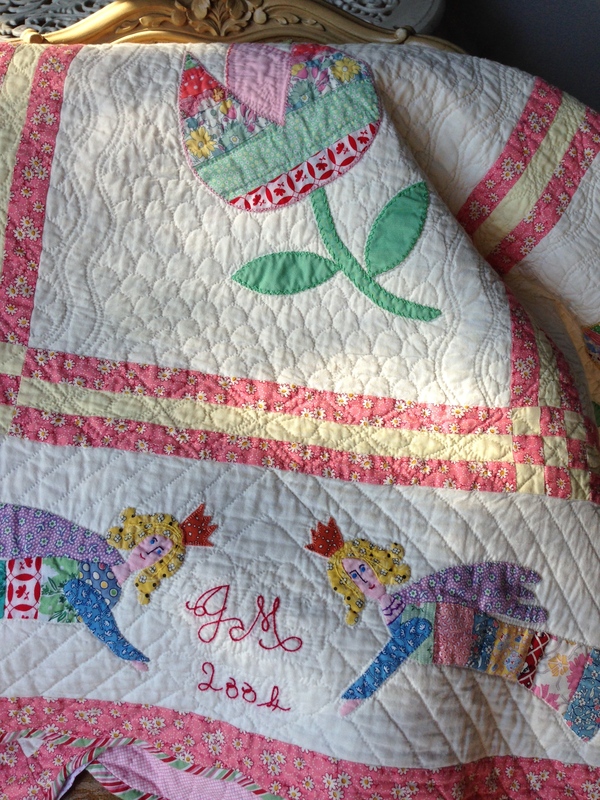 The quilts are simply hand quilted with neat, even quilting. Many designs belong in the category of Postage Stamp quilts and this lay-out of the squares using the red surrounded consistently by a floral fabric set with white can be identified as Jewel Box or Steps to the Altar. 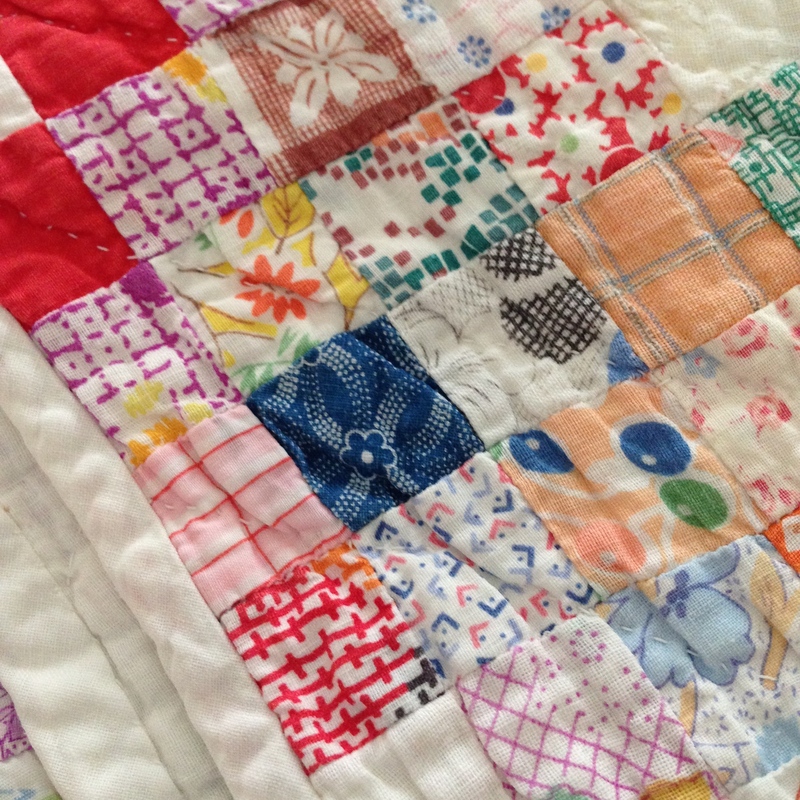 The maker of this quilt not only saved her strings and strips, but saved the thread from the feed sacks at her disposal, to stitch the strings onto newspaper foundations. 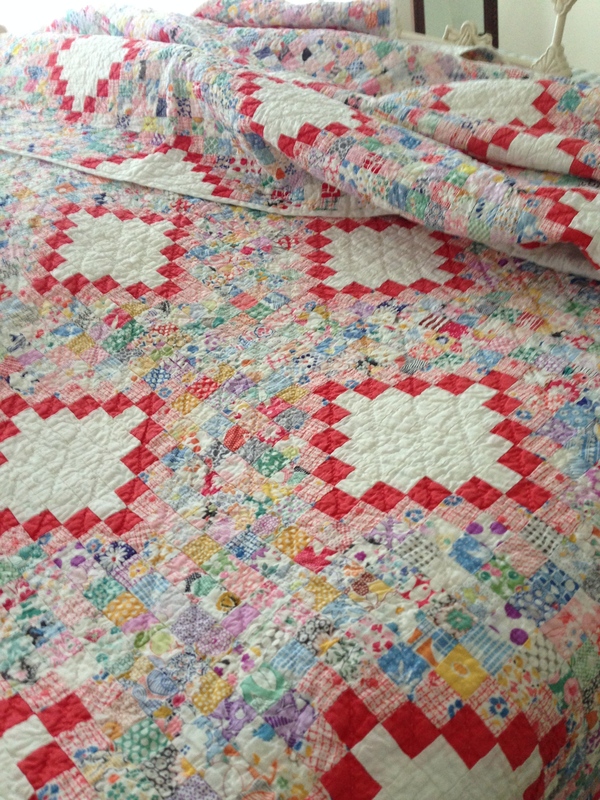 The quilt consists of 288 blocks which were stitched by hand onto the foundation. The 288 four and a half inch blocks were stitched together by machine, once again probably a treadle. 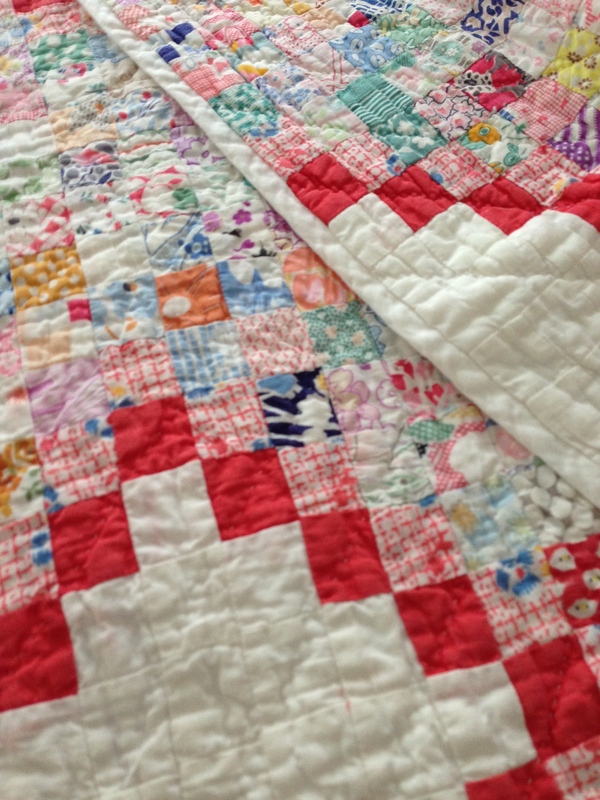 There are some amazing fabrics used in this quilt including many feed sack fabrics, ginghams, solids, stripes, plaids and most pleasing to me red polka dots. The strings range in size from one quarter inch pieces to 3 inch at the very largest. This quilt maker would not have been following a pattern or instructions but would have worked freely and intuitively to create a vibrant design without letting one tiny string go to waste. I have been inspired to make string quilts and continue to add to my scrap bag saving dressmaking scraps, recycling my son’s expensive pure cotton shirts,saving postage stamp size pieces and strings and strips from every quilting project. The String Pieced Star and the Alice’s Tulips quilt, made in memory of my mother-in-law, are two of my attempts at string piecing. Needless to say there are many more quilt plans ahead. The postage stamp quilt is wonderful!! I agree that the red is what makes everything pop. The string quilts are interesting,your star block is neat! Thank you, glad you liked the quilts. Have a lovely Easter, regards Janette. Beautiful blog. I am so glad I found you! I especially love old vintage fabrics and quilts. Thank you for your lovely comments and so glad you found the post interesting. 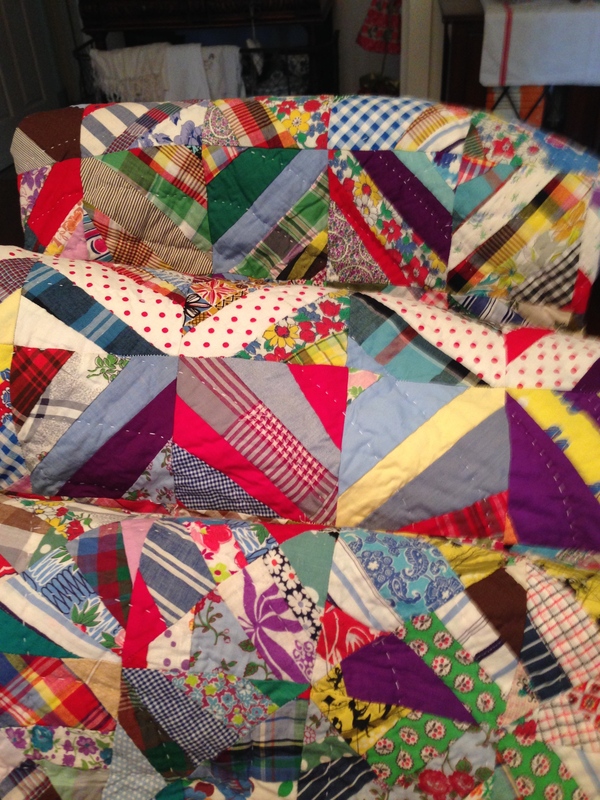 Old fabrics and quilts provide so much inspiration. Thanks Janette for another great article. I love seeing your postage stamp quilts. Makes me want to start one of my own. Hi Joy, Glad you liked the Post and the quilts. I would love to start one too, but need to get a couple more quilts finished. There are some nice Postage Stamp designs to work with too. However, I am saving all the scraps even the tiny ones. Hi, Janette. What beautiful quilts on this post! I am currently in a postage stamp quilt swap, and I may just change my design plans based on the one with the beautiful red and white squares in the midst of the random scraps. 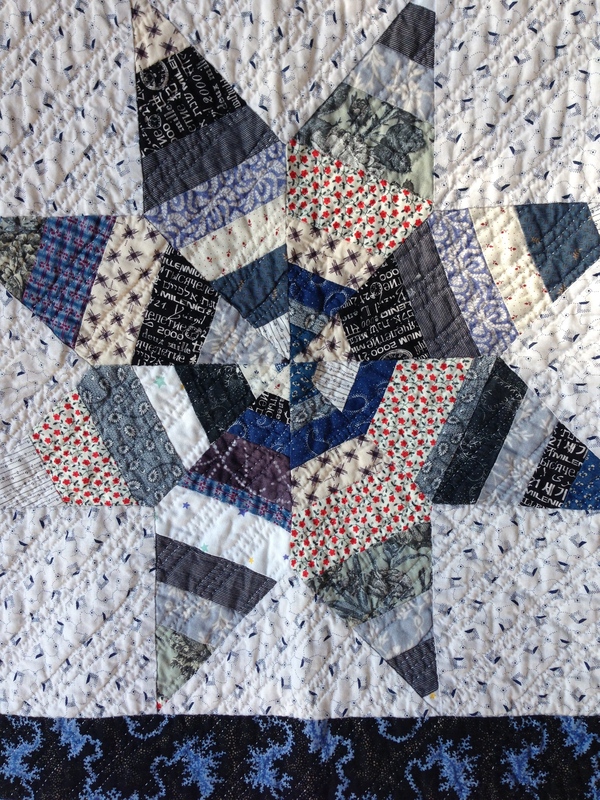 Love the string star because of the blue–I love blue and white quilts, they look so fresh. And your Angels and Tulips is GORGEOUS. Is the angel modeled after your mother-in-law? I am so glad I found you today. I will be back. Thank you for your kind comments. 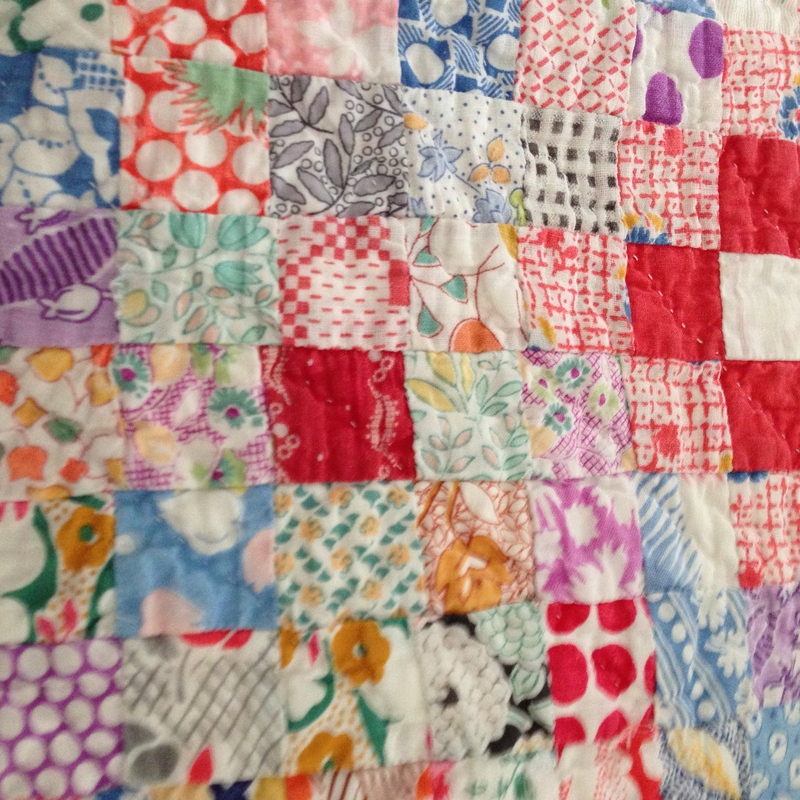 I think having a postage stamp quilt swap is a wonderful idea. 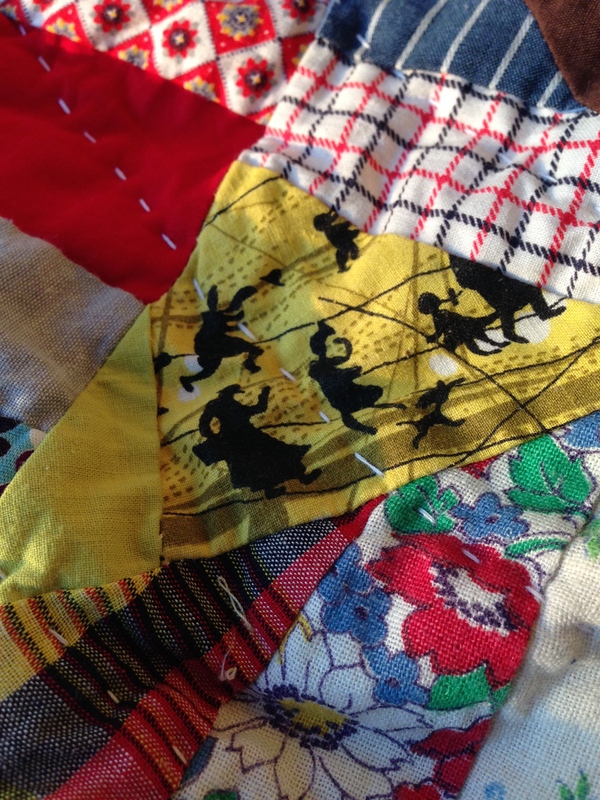 Are you swapping fabrics, blocks or finished quilts? 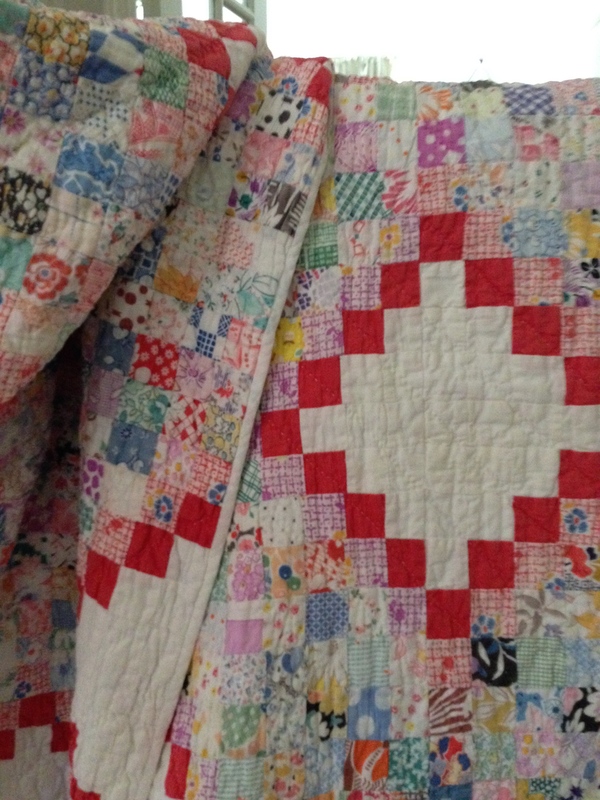 I also love the design on the quilt on the blog. It has so many different fabrics, every time I look at these quilts (there are two) I see a different fabric. The Alice’s Tulip quilt was made in memory of my mother-in-law and the quilt was first inspired by old strip pieced quilts and a book by Sandra Dallas called Alice’s Tulips. The angel was from a drawing I did (although not of my mother-in-law) and thought I could use it on the quilt border and made the dresses out of strips. I hope to do some new posts soon. So once again Thank you for visiting, enjoy your Postage Stamp quilt making. We’re swapping no-repeat-fabric 2-inch squares, 100 per swap partner (you can have up to 8 swap partners). It’s amazing how you rarely get a duplicate between one swapper and another. Enjoyed looking over thr various quilts. I am curious about swap partners. Do a group of ladies make a square block all the same size and swap and then make a a quilt from the swapped blocks? Sounds like something I would like to do. How do you get a project like this started? 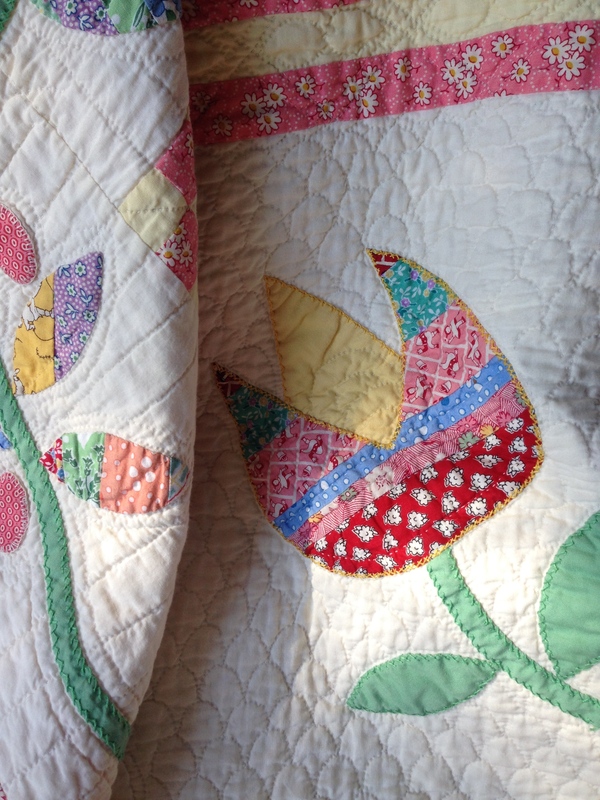 Suggest you look at the Curious Quilter’s blog re: her swaps…. and all the rules are laid out for her swaps. Plus she would be glad to hear from you about your interest in starting your own, I’m sure. I’ve participated in two online swaps with Mary and had a great time. Different groups do their swaps different ways, just depends on what the group wants–at least that would work for a group of friends or a local quilt guild just starting on a swap.,,,decided by consensus. Otherwise, if one or two people start an online swap, you would make the rules and type of swap clear ahead of time, and advertise for people interested.